The chill in the wind and the prospect of flat tires proved no match for senior Tatyana McFadden as she finished first in Sunday’s ING New York Marathon women’s wheelchair division, achieving an unprecedented Grand Slam of the Boston, London, Chicago and New York marathons in the same year. Setting a personal course record, Illinois’ McFadden won the race in 1 hour, 59 minutes and 13 seconds, finishing nearly four minutes ahead of runner-up Wakako Tsuchida of Japan. 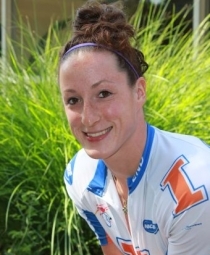 Teammate Amanda McGrory, who won the race when it was last held in 2011, finished fourth at 2:05:06.